February 2017 wasn't an easy ride for digital rights here in Pakistan. As we still await one of the five missing bloggers to return home, the law enforcement has been busy taking away citizens' rights to speak online under the draconian laws, poor journalism ethics ruled the TV screens and caused chaos in the country, and Digital Rights Foundation's Cyber Harassment Helpline completed its 3 months of operation. Here's a round up of the incidents that had out attention! While it came to light at the end of January that 4 of the missing activists had returned home, Samar Abbas still missing remains missing. Samar’s disappearance has been linked to the series of enforced disappearances of activists and bloggers at the start of January--Samar was reported missing 11th January, 2017. Given the lack of information by the state authorities and the returned activists themselves, there is no clarity on why the activists were picked up or the reason Samar in particular remains missing. Samar’s wife, Najamus Sahar, has spoken about the emotional toll the disappearance has taken on her family. In a petition directed at the missing bloggers, Justice Shaukat Aziz Siddiqui, through a single bench at the Islamabad High Court, ordered the Pakistan Telecommunications Authority to block pages or websites containing blasphemous material on social media. It is unclear how this order will be interpreted by the PTA. Furthermore, if the PTA chooses to follow the order what criteria is being used to determine content as blasphemous? While the PTA is at it, it would be great it they can also remove material containing hate speech against minorities and marginalised communities. The term “fake news” has been weaponised by the current US president to target any news outlet that dares to fact-check him, however it has also become a referential point of analysis for pervasive news items and rumours that are demonstratively wrong, yet are still shared on social media and even picked up by the mainstream media. In times of mass confusion and lack of trust in official statements, fake news can become an agent of panic and paranoia. In the aftermath of the Lahore Defence bomb blast/cylinder explosion (there is still no clarity on which of these is fake news), panic gripped the streets of Lahore as social media, mainstream news channels and WhatsApp groups were inundated by the news of a bomb blast in Gulberg. 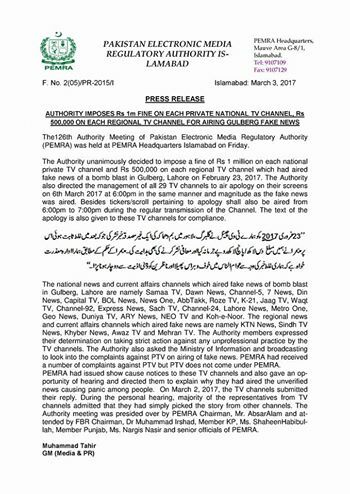 31 news channels were initially served a notice by PEMRA in the wake of this incident, out of which 29 news channels are fined and asked to air an apology on March 6th, 2017 between 6:00 PM and 7:00 PM in the same magnitude as the fake news was aired. For more clarity on fake news and how to counter it, read Hija Kamran’s post “F is for Fake News!” for DRF here. Social media celebrity Nasir Khan Jan is known for his videos and covers. However on 8th February, 2017 was arrested and detained by the Police on grounds of “obscenity”. While he was granted bail by a lower court in Lower Dir on 11th February, 2017, his case has been referred to the Cyber Crime Wing of the Federal Investigation Agency (FIA). The police has informed the media that he was arrested under Section 107 of the Pakistan Penal Code, which deals with “instigation” of others. 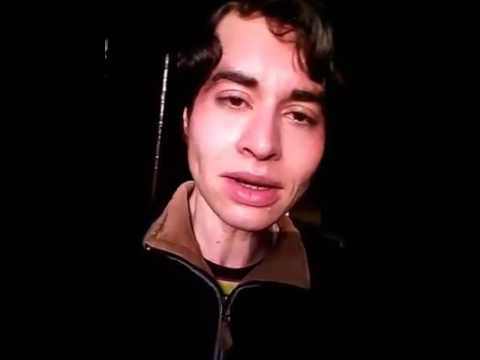 It is unclear what exactly the police are accusing Nasir Khan Jan of doing. This is a clear violation of his right to freedom of expression in online spaces and a case in which the vague terminology of obscenity is being used to intimidate online personalities. Read DRF’s statement condemning the arrest here. Cyber Harassment Helpline completes in third month! DRF’s Cyber Harassment Helpline has marks 3 months of successful operations. Launched on 1st December, 2017, the Helpline has handled over 358 complaints in the short span of its operations. The Helpline Team hopes to expand and improve its services and outreach. Several innovative approaches towards outreach have already been taken. The detailed report on the Cyber Harassment Helpline's first 3 months will be launched in coming days.